Although vitamin B-12 deficiency is more common in individuals over 50 and in those with conditions such as pernicious anemia or stomach or intestinal disorders, it still affects up to 15 percent of Americans. The only natural sources of vitamin B-12 are meat-based products, making it necessary for vegans to turn to fortified foods or supplements to get adequate amounts of this important nutrient. Vitamin B-12 supplements are available over-the-counter in liquid form and from your doctor in injection or nasal gel form. The most effective and appropriate supplementation option for vitamin B-12 depends on the nature of the deficiency. 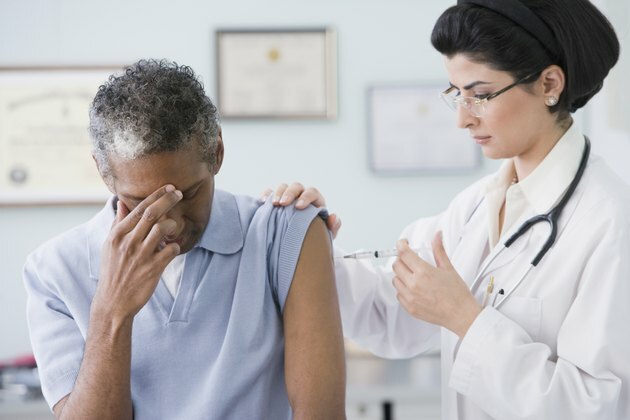 Vitamin B-12 shots are available by prescription, generally for individuals with conditions that interfere with the body's ability to absorb B-12. Liquid vitamin B-12 supplements are comparable to tablet or lozenge form, as far as absorption and effectiveness are concerned. Oral forms of vitamin B-12 at various dosages may be effective for preventing and treating deficiency caused by diet or low levels of stomach acid, according to National Institutes of Health website Medline Plus. Vitamin B-12 injections are only available through health-care professionals. Vitamin B-12 shots are injected directly into the muscle, making them particularly effective for individuals who can't produce intrinsic factor, a protein that escorts vitamin B-12 into the small intestine. Injected B-12 supplementation makes it possible for your body to use B-12 without having to depend on intrinsic factor. It would take high dosages of oral vitamin B-12 to get the same effect. Vitamin B-12 is available over the counter in liquid form. The potency of liquid vitamin B-12 varies by manufacturer. The recommended intake for vitamin B-12 is 2.4 mcg daily. However, a little more than half of a 1 mg dose of B-12 is absorbed in healthy individuals, according to the National Institutes of Health Office of Dietary Supplements. The typical dosage for general supplementation is up to 25 mcg a day, or up to 100 mcg per day for individuals over 50. For people with problems absorbing vitamin B-12, a high oral dosage of up to 10,000 mcg may be prescribed as an alternative to injections, although Medline Plus says that lower dosages of 647 mcg to 1,032 mcg may be effective. Consult with your doctor before consuming high doses of vitamin B-12. Vitamin B-12 supplements are generally more effective when consumed with other B vitamins. For this reason, you may want to consider a B complex supplement if your primary concern is a lack of -- or limited amounts of -- B-12 in your diet. Consult with your doctor about the appropriate form and dosage of vitamin B-12, based on your specific needs. Vegetarian Resource Group; Vitamin B-12 in the Vegan Diet; Reed Mangels; Ph.D., R.D. What Are the Benefits of Liquid Vitamin B-12?